The skin’s texture and tone can be affected by genetic factors, but exposure to changes in temperature and a lack of regular skincare are the main contributors to flaking skin. Flaking skin usually occurs because the skin is dehydrated and aggravated by sharp changes in temperature. When we spend time in the sun, its rays heat up the external layer of the skin and encourage flaking and dryness and the appearance of chapped skin. A common error is to rub the face or pull the loose skin away, which we should try to avoid as much as possible. 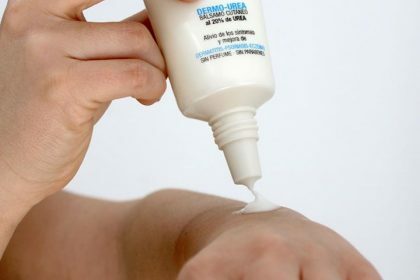 Removing the dry skin can irritate the skin underneath and lead to redness and inflammation. Moisturising improves tissue regeneration and prevents the skin drying and becoming flaky. We can also drink more water, and it is advisable to apply moisturising cream to the skin to rehydrate it and help the skin respond naturally. The main function of the urea is to prevent the body losing moisture through the skin, but it also helps affects the cells to protect the skin from becoming flaky. The urea is active in several internal processes, including the elimination of excess nitrogen and retaining moisture, and maintaining the skin’s hydration levels. These properties mean that urea is frequently used in modern cosmetic moisturising creams and in the treatment of skin problems such as hyperkeratosis, dermatitis, psoriasis and eczema. TH Balsam Nature Dermo Urea contains 20% urea, which is used as an important active ingredient in atopic dermatitis treatments. Urea is an effective and fast solution for dry skin. Clinical studies have demonstrated that after 3 weeks of daily application, hydration levels of the dermis can increase by between 14 and 26%. JOJOBA OIL: Used in skincare for its hydrating and softening properties. GLYCERINE: With moisturising and softening properties. VITAMIN E: An antioxidant for the skin, with free radicals. BISABOLOL: With soothing and decongestive properties.